With the autumn migration over and the likelihood of any further rarities dropping in diminishing by the day, it's time to reflect on what kind of autumn it's been, putting aside the fact that it's possibly been one of the warmest on record. I suppose from a national perspective it will probably go down as one the best ever for rare and scarce migrants, although not being a twitcher I contented myself by reading the many reports from around the country. 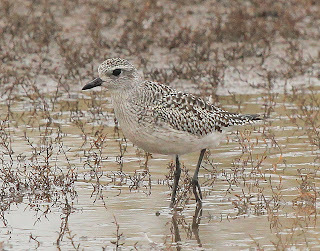 The late part of September saw the remnants of two Atlantic hurricanes hit UK shores, bringing with it North American waders and land birds. A flock of 26 Buff-breasted Sandpipers gathered in Wexford, whilst on the Isle of Scilly an early Red-eyed Vireo was joined by Northern Waterthrush, Black-and-white Warbler and Baltimore Oriole. My personal best during this time was my first local inland Gannet, when one dropped in at Draycote Water. 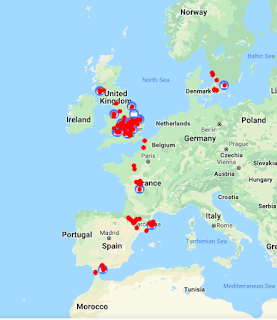 At the beginning of October high pressure stretched from the UK all the way to North Africa and the resulting winds provided ideal conditions for our departing summer visitors. From the middle of October the winds turned more easterly and continued on and off until the end of the month. Despite Redwing and Fieldfare entering the country in their thousands accompanied by some early Waxwing, the highlight would have to be the 50 Short-eared Owls which made landfall at Tichwell, Norfolk on the 13th. From a personal perspective I managed some of my very own migration highlights with Short-eared Owl at Brandon Marsh, plus Crossbills at Napton Reservoir and two very early Bewick Swans on my own doorstep, when I discovered two birds resting at the marina. 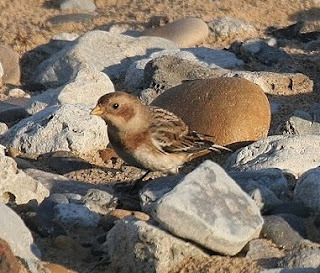 In November I managed a week on the Lincolnshire coast with my wife Dee and here we managed further migration highlights when we were lucky enough to see a Short-eared Owl make Landfall at Donna Nook and on the same day recorded Snow Bunting, Lapland Bunting and Merlin. Also seen of note during our stay was my first UK Arctic Redpoll at Spurn, accompanied by Brambling, Long-eared Owl, Wood Lark and my first Whooper Swans, Pink-footed and Barnacle Geese of the autumn at Frampton Marsh and Freiston Shore. All in all I'm quite happy with my lot for the autumn migration, which also includes good numbers of Lesser Redpoll and Siskin, and over the past several days a trawl of my local Long-eared Owl roosts has also turned up my first local bird of the autumn! After three attempts I finally caught up with a local Short-eared Owl this morning which a fellow boater had put me on to quartering a field off the Napton to Stockton road. 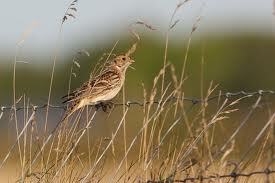 It's great to have one on the local patch and I just hope it decides to hang around for a while longer. I have to say that although the birding wasn't that prolific I really enjoyed the time spend with the guys, which included lots of banter, most of which was at my expense! 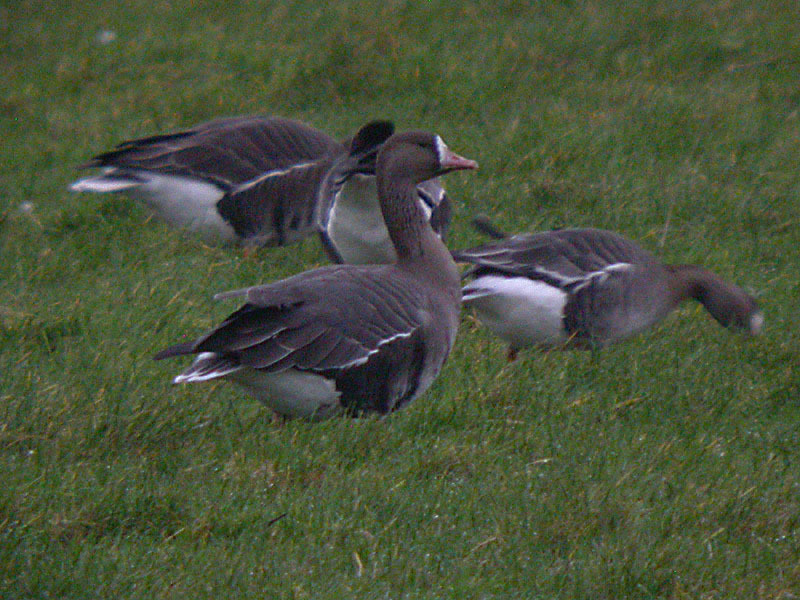 I won't mention the missing White-fronted Geese, oops!! It was quite a surprise for me to see how the reservoir had decreased even further in water mass since my last visit several weeks ago, something that must surely be of great concern for Severn Trent Water. A walk along Farborough Bank up to the Spit produced of note ♂ and ♀ Goosander, a lone Yellow-legged Gull out on one of the islands, shortly after followed by a single ♀Common Scoter, which remained distant. Lapwing were in excellent numbers and a huge flock seen across towards Draycote Bank had 7 Dunlin within. A decision to backtrack for a look at Rainbow corner turned up around 45 Golden Plover over, an extremely agile Peregrine, which attempted but failed to take a Wood Pigeon mid flight, and a few remaining Skylark heading south. 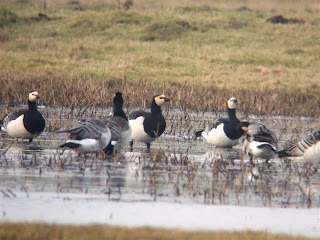 Having failed to locate the recent White-fronted Geese a decision to return to Farborough spit proved successful with 10 birds located in the field below the bank. Time spent scrutinising the surrounding field proved fruitful with Sparrowhawk, Common Buzzard and Richard managed a lone Grey Partridge, which was accompanied by 5 Red-legged, of interest too were around 15 Guinea-fowl which were fun to see. After departing Draycote and lunch at Brandon Marsh I managed once again to miss the Bittern by minutes on East Marsh Pool. In the hour or so I spent at East Marsh I managed the 2♂ and 2♀ Goldeneye, which are still on site, and finished with: 132 Golden Plover, 6 Wigeon, 6 Gadwall, 22 Pochard, 9 Snipe, 26 Common Gull, 9 Lesser black-backed Gull, plus excellent numbers of Teal and Shoveler. The walk back to the nature centre yielded: 5 Lesser Redpoll, 4 Siskin, 2♀ Bullfinch, and small numbers of Redwing and Fieldfare. 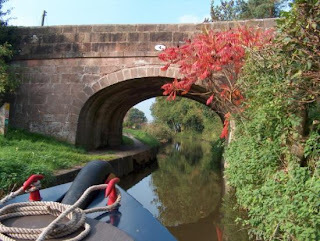 With heavy rain pounding on the boat roof at around 5am and the forecast of yet more fog and low cloud I made a concious decision to turn over and have a lay in this morning. I also decided to take a look at a nearby field after a text message last night tipped me off regarding a Short-eared Owl seen at dusk, and so didn't arrive at Brandon Marsh until just after 9am, no Owls in sight! Not the best decision I've made when a phone call from Brandon came through with news of a Bittern showing well on East Marsh early on. Needless to say I've still not as yet made contact this autumn, but hey it's early days. Despite the gloom Brandon had it's moments, the best of which were the 2♂ and 2♀ Goldeneye, still around from Saturday, plus 4 Cetti's Warbler heard, 3 Lesser Redpoll, 5 Siskin, 1 Kingfisher, 87 Golden Plover, a half dozen Wigeon and a brief glimpse of a Chiffchaff from the Big Hide. Carlton Hide, which I'm glad to say is now filling back up nicely with water, held 5 Snipe and a single Water Rail. The escaped New Zealand Scaup was also around at West Marsh and 6 Skylark flew south on the walk down. Lots of mixed Thrush flocks today which included excellent numbers of Blackbird, at least 20 or so of which had black beaks, more likely 1st winter Scandinavian. It's also worth noting that 3 Song Thrush were heard singing too. A stop off at Napton Reservoir on route home, nearly crushing 6 Red-legged Partridge who ran out in front of me, produced circa 70 Wigeon, Great Crested and Little grebe, a lone Grey Wagtail and a huge flock of around 150 Fieldfare, with smaller numbers of Redwing mixed in. Despite the unfortunate extraction (don't get me started!) of a huge amount of reed bed back at the marina, the Pied Wagtail roost still contained good numbers with around 250, and as the weather finally broke to the west the sky was awash with literally thousands of Gulls heading for the Draycote roost! 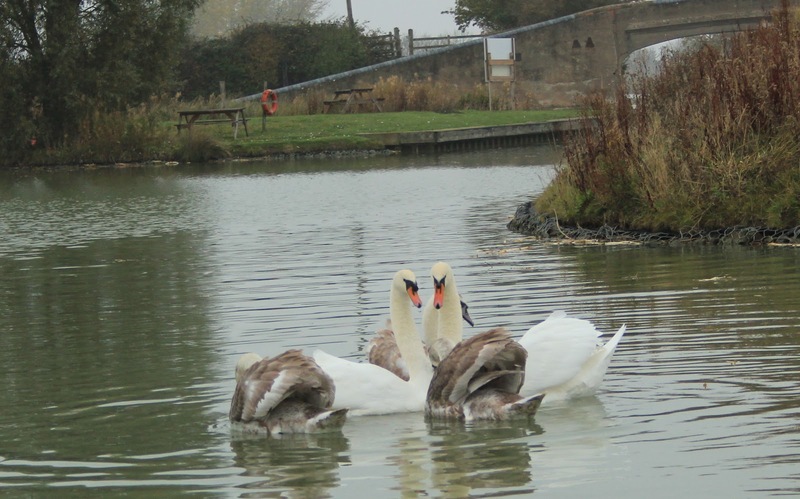 Posted above is a picture of our resident Mute Swan family taken from my window, which I thought would brighten up this post on an otherwise gloomy day! It's been such a hectic week I haven't even had the time to update the blog with details of our last day before coming home from Lincolnshire last weekend, when we visited RSPB Freiston Shore on the Friday. One of the main reasons for my lack of blog time has been the work involved in finishing a presentation that I gave at Brandon Marsh on Wednesday evening, which covered my birding exploits in Canada. I have to say that it was really enjoyable to relive the moments of our RV tour last September and it was a good turnout too! Freiston Shore for those who have not visited before lies around 4-miles east of Boston and consists of salt marsh, lagoons and off shore flats. Dee and I visited last year and thought it would be a nice end to our trip. The weather certainly didn't improve during our whole week and as it started, it finished with low cloud, mist and a cold easterly. The highlights of the day was a healthy population of Tree Sparrows and good mixed flocks, which consisted of Goldfinch, Siskin and Lesser Redpoll. 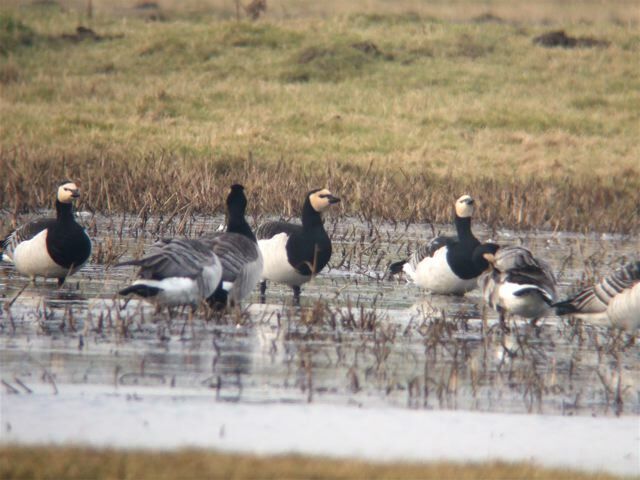 The lagoons held excellent numbers of Wigeon, Shelduck, Little Grebe and Teal, the surrounding marsh had Brent Geese, Pink-footed and 8 Barnacle Geese, which were our first of the week. 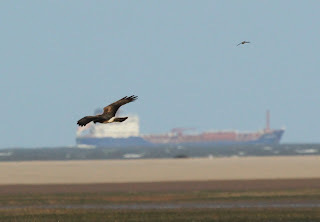 A walk out to the observation point which looks out to the distant sea, (once again the tides were unfavourable), yielded Marsh Harrier, Merlin and plenty of Redshank and Curlew. Finally, a small tidal pool at the rear held a lone Black-necked Grebe, a good end to the week. When I stepped off the boat this morning on route to Brandon Marsh it was a crystal clear sky, by the time I arrived at Brandon some 30 minutes later the mist had rolled in making observation difficult. I'm definitely ready for those Atlantic lows to start taking control. 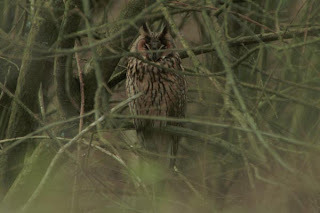 I spent a half hour vigil overlooking Sheep field in the hope of Short-eared and Barn Owl, but alas it wasn't to be. However, things improved when I accidentally flushed my first Woodcock of the autumn when one took flight right in front of me. Despite several sightings of Bittern over the previous week the bird continues to evade me, although a few of the other chaps in the conservation team have managed views. I'll never here the last of that one!!! Also of note during my early visit were: 2♀ and 2♂ Goldeneye, Gadwall (5), Snipe (9), Golden Plover (32-over), Cetti's Warbler (7-heard), Goldcrest (2), plus various numbers of Pochard, Teal, Tufted and Shoveler on the pools, with Siskin, Redwing, Fieldfare, Lesser Redpoll, Kestrel and Buzzard elsewhere. While completing my boating chores after arriving home a large group of around 150 Fieldfare took flight from the direction of Napton Reservoir, closely followed by a couple of Sparrowhawk s!! 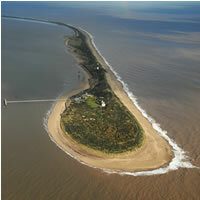 Spurn Point is somewhere that I’ve heard lots about but strangely enough have never visited. Spurn is a very unique place in the British Isles, only three and a half miles long and down to only fifty meters wide in places with the sea either side. Extending out into the Humber Estuary from the Yorkshire coast it has always had a big affect to the navigation of all vessels over the years. Help to some and a danger or hindrance to others. 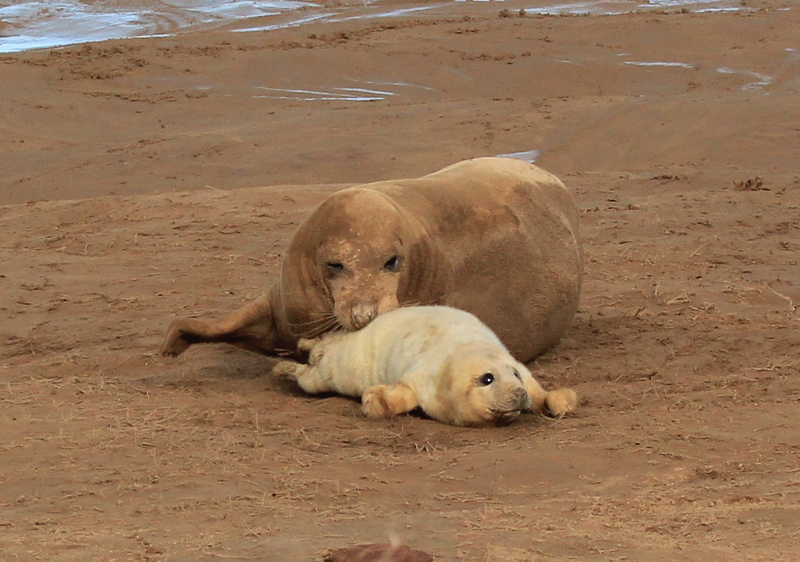 This alone makes Spurn a unique place. Bird observations have taken place here since 1938. This included a roll-call of species, the beginnings of a recording system, which later became standard in bird observatories and continues today at Spurn. The day did not start well! Having been informed by the local weather forecast (and someone who will remain nameless) that today was probably the best day to visit, as soon as we left the outskirts of Hull, having earlier crossed the Humber Bridge in lovely morning sunshine, the fog blew in! Having relieved us of our £3 a very nice guy from the Yorkshire Wildlife Trust proceeded to make me feel even better by informing us that only an hour before our arrival the sky had been a lovely blue and that the fog had only just rolled in off the sea! Notwithstanding, we continued on and decided to check out Chalk Bank hides, which overlook the estuary. Here we scanned the fog, Dee picking out a single Little Egret in the scope and one or two movements in the gloom but alas it was to no avail. Things did however improve immediately after decamping from the hide when Dee spotted a Short-eared Owl in flight, dropping down into the grass not far from us to the delight of our friends John & Pat. Did things improve even more? 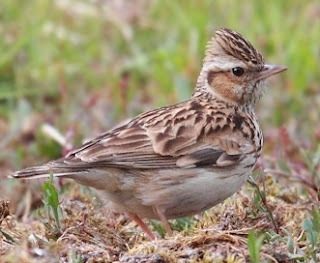 Happily yes they did, when after an hour or two of checking out every movement in the gloom we came across our second decent bird of the day with good views of a lone Woodlark near the RNLI centre. A walk out to the point across the dunes produced a Long-eared Owl, which had been accidentally flushed by an earlier birder, and we enjoyed a number of good flight views as the bird flew several times trying to find another decent roosting spot. By the time we reached Spurn Point the fog had lifted sufficiently to allow views out to sea and we spent a good while here with a flyover of Great Northern Diver, around 70 Pink-footed Geese and various small numbers of Wigeon, Common Scoter, Brent, Shelduck, Red Breasted Merganser and Scaup. The best as far as our friends were concerned were the two Porpoise (probably harbour) which breached the water, showing their dark back and fin. The walk back across the dunes produced Goldcrest, Mealy Redpoll, one of which I’m convinced was Arctic, although to be honest I’ve only ever come across this species once before, Black Redstart (2) and numbers of Fieldfare and Redwing, sadly once again bombing on the earlier reported Waxwing! A chat with Paul Doherty at the car park, who I eventually recognised by his voice, which I’ve heard many times on his excellent DVD’s, revealed that I’d also bombed on Siberian Chiffchaff and a late Willow Warbler and he did raise an eyebrow when I mentioned Arctic Redpoll, but did say that one had been reported a few days ago! Everyone loves Seal pups right? and so it was no surprise that our guests suggested a trip to Donna Nook, having seen a selection of Dee’s photographs from our Sunday visit, and who are we to disappoint. Unfortunately the weather hasn’t been on our side during our weeks stay here in Lincolnshire and so on arrival the gloomy conditions persisted. However, around mid afternoon the first signs of brightness out to the west, followed by the odd sunny break, seemed to act as a catalyst and produced a good deal of movement on the birding front. 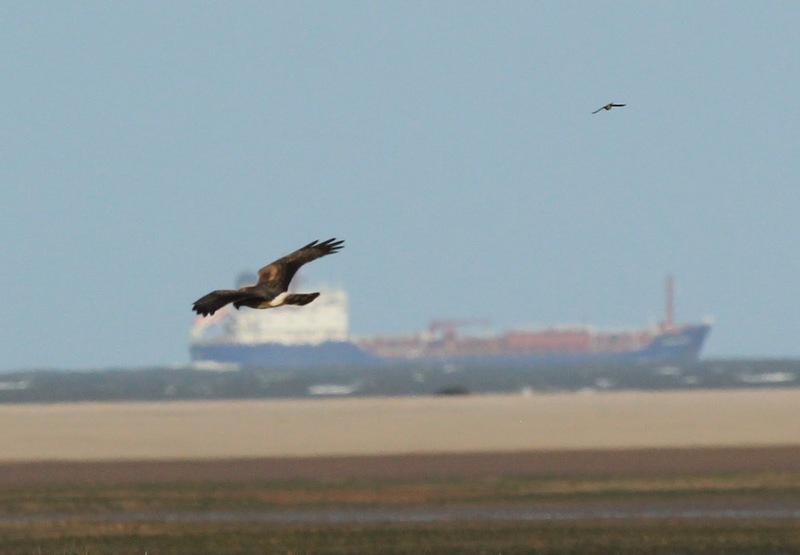 Firstly, a Short-eared Owl being mobbed by several Crows came in off the sea, eventually coming to rest just in scope range, shortly followed by our second Ringtail Hen Harrier of the week, which threw the whole area into frenzy. As if this wasn’t enough, overhead two small raptors also being mobbed turned out to be Sparrowhawk and Merlin. Raptor heaven! After enjoying a cup of soup from the car park catering van and a chat with one of the Seal wardens, who kindly put me onto a small group of Tree Sparrows, 3 Brambling, 2 Lapland Bunting and distant views of 4 Ruddy Shelduck, I managed to persuade everyone to take a walk south along the sand dunes. The bird movements continued throughout our walk with various size flocks of Knot, Golden Plover, Oystercatcher and Dunlin, plus 18 Black-tailed Godwit, too many Shelduck and Brent to count and our first Snow Buntings, when 4 came down along the path in front of us! Large flocks of Fieldfare were once again a constant, mingled with Redwing and more Blackbird today, plus the usual flow of Skylark and Meadow Pipit. 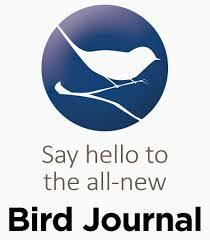 Also recorded of note were: 2 Whooper Swan, Lesser Redpoll, Siskin, Linnet, and Goldcrest. Needless to say John and Pat, our close friends and guests for the rest of the week have taken a slight shine to this birding lark (no pun intended) and unselfishly I’ve suggested to everyone that a visit to Spurn Point may be worthwhile!! Thanks to Dee for the photo's. Over the previous couple of days Dee and I have managed visits to both Frampton Marsh and Gibraltar Point. With our non birding friends joining us at our holiday cottage for the remainder of the week we thought we’d try and cram in as much birding as possible before their arrival. RSPB Frampton Marsh is around a 30-minute drive and boasts coastal wetland, reedbed, large freshwater scrapes and wet grassland. The reserve also has 3 hides, two of which offer 360-degree views, plus there are over 3km of footpaths to explore. Despite the gloom, constant drizzle and bracing north-easterly wind the birding, although no prolific, wasn’t too bad and taking occasional shelter in the hides we managed a good session. Raptors included Kestrel and Merlin but the highlight was watching a Peregrine making several attempts to capture a very tricky Redshank. Fortunately for the lucky Wader the battle ended Waders 1 Peregrine 0. 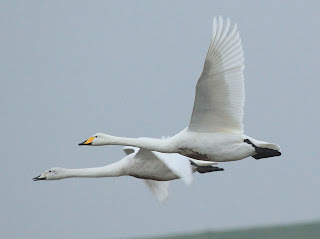 At Frampton the newly arriving Whooper Swans continue to pass through and Dee managed to capture an adult bird and juvenile in flight despite the awful photographic conditions, 7 birds were seen in total. 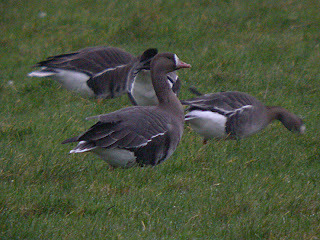 Also beginning to arrive in small numbers are Pink-footed Geese and we recorded 5 during our stay. Also seen of note were: At least 500 Brent Geese and various numbers of Shelduck, Goldeneye, Pintail, Pochard, Gadwall, Little Egret, Redshank, Curlew, Ruff, Black-tailed Godwit, Dunlin, Golden Plover, Skylark and Meadow Pipit. The weather had only improved slightly by the time we reached Gibraltar Point on Tuesday morning, at least it stayed dry, but once again Dee and I enjoyed a decent day. 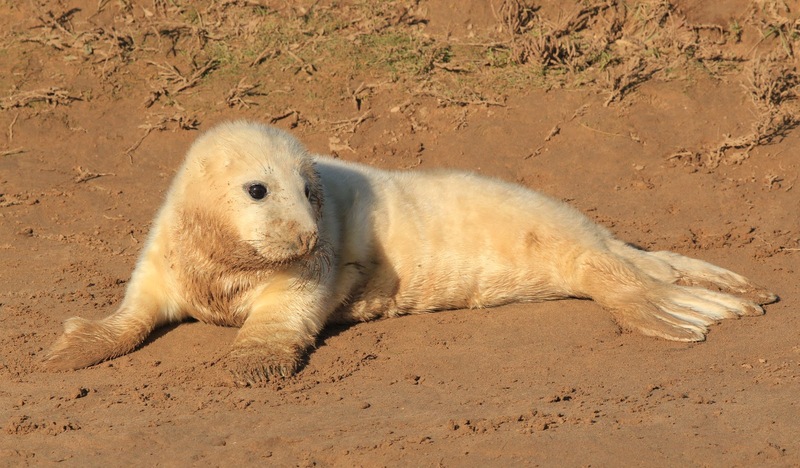 This reserve covers 3 miles of coast from Skegness to the Wash. Habitats include sandy and muddy seashore, sand dunes, saltmarsh and freshwater marsh with ponds and lagoons. 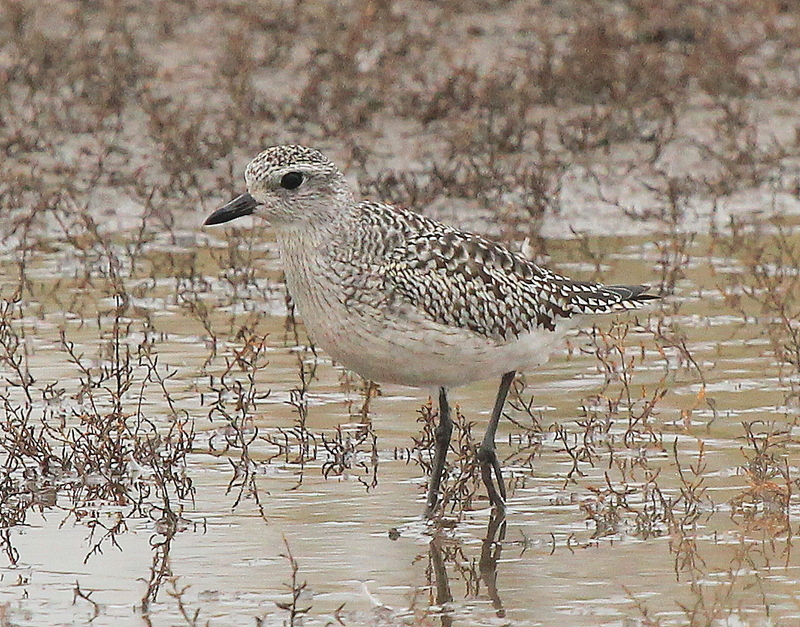 Grey Plover in the gloom! On arrival a quick look at the recent sightings board revealed Twite, Woodcock and Snow Bunting and you’ll be interested to know that we bombed on all three! However, another very enjoyable days birding which included Marsh Harrier and some great views of Grey Plover, Dee taking the opportunity of a prolonged photo session, one of which is posted above! Despite the tide being way out a good selection of species to report with: Sanderling, Turnstone, Oystercatcher and Grey Plover on the beach area, plus further large number of Brent and more Grey Seals. Large numbers of Redwing and Fieldfare continue to flood in on the easterly wind but sadly no Waxwing amongst them yet! At the cottage a Tawny Owl can be heard nightly and through the night last night some decent passages of Whooper Swan and Pink-footed Geese could be heard regularly, in fact as I post another 20 or so Pink-footed are passing through. I was fortunate to miss the heavy downpour that arrived just after midday as by coincidence I'd left the work party at Brandon Marsh early due the wife's birthday celebrations. This morning a Barn Owl was still hunting well after sunrise near the golf course, probably due to the heavy overnight rain which we desperately need. Stills lots of our winter visitors at the marsh with the now resident Fieldfare, Redwing, Siskin and Lesser Redpoll, plus at least 35 Golden Plover on East Marsh Pool. 1st Bewicks of the Autumn! The surprise of the day came about when I was having a coffee on the pontoon chatting to my neighbours. 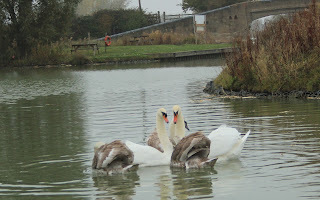 I'd noticed two Swans in the far corner of the marina tucked away in amongst the reeds. They looked slightly smaller than our resident Mute Swans and I sensed straight away that they might be something different! 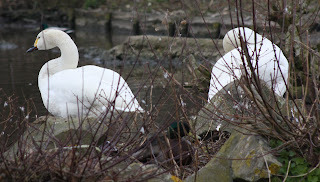 My neighbour, who's not a birder by any means, couldn't quite see what all the fuss was about, it's only a Swan says he!! Camera in hand I approached with my usual amazing stealth, almost breaking my neck as I gingerly climbed up the bank. Fast asleep I waited, patience is not a virtue, and eventually one raised his head to offer the picture posted above, before dropping back to sleep! Their still asleep as I write. First Bewick's of the autumn for me and right on my doorstep, what a delight. Dropping off one of the wife's work colleagues at Heathrow Airport at 6.30 this morning prior to my usual Tuesday Brandon visit I was amazed to see no less than 6 Red Kites already on the wing when I passed the usual hotspot on the M40 motorway at Wycombe! A re-introduction area for these magnificent birds several years ago they are simply spreading like wildfire, to see their huge silhouettes against the early morning gloom was just wonderful. 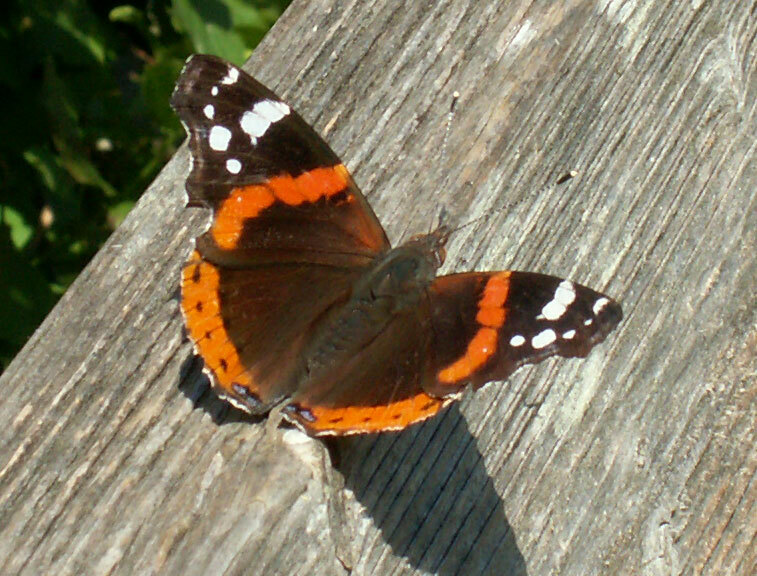 Red Admiral on November 1st! A gorgeous autumnal day at Brandon Marsh once the early showers moved through and some surprise visitors too when 73 Golden Plover dropped on to East Marsh Pool at around 10.30am. At the time Paul, John, Peter and I had just been watching a day hunting Barn Owl at the rear of the Carlton Hide and quickly doubled back to big hide for a glimpse. Lots of Fieldfare, Redwing, Lesser Redpoll and Siskin have now started their regular demolition of the summer berries and seeds with the latter tucking into the Alder, and the Thrushes devouring the Hawthorn berries. Several Skylark were moving south during my stay, 2 Green Sandpiper were on Teal Pool and the usual selection of Pochard, Teal, Gadwall, Shoveler, Tufted and Mallard were on East Marsh Pool. Also seen of note were: Circa 350 Lapwing (this includes 1 Leusistic), 3 Bullfinch, 2 Nuthatch, 1 Grey Wagtail, 6 Jay, 3 Cetti's Warbler, 3 Goldcrest, 2 Water Rail and 3 Snipe. 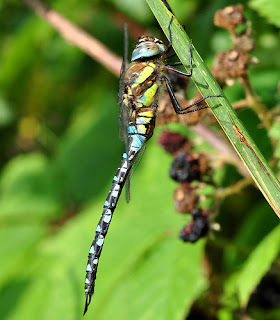 Birding aside the most remarkable thing for November 1st was the amount of Dragonfly on the wing with around 30 or so Common Darter, the females of which were constantly dropping onto West Marsh Pool to lay their eggs. Also seen were 2 Red Admiral Butterfly, obviously not ready for hibernation just yet, and a single Migrant Hawker. A record count this evening of our roosting Pied Wagtails here at the marina, with over 250 counted! I really must endeavour to check them all out one day!